Black Speckle metal finish enhances the appeal of this piece. Dark Espresso wood finish creates a beautiful contrast with the metal rails. 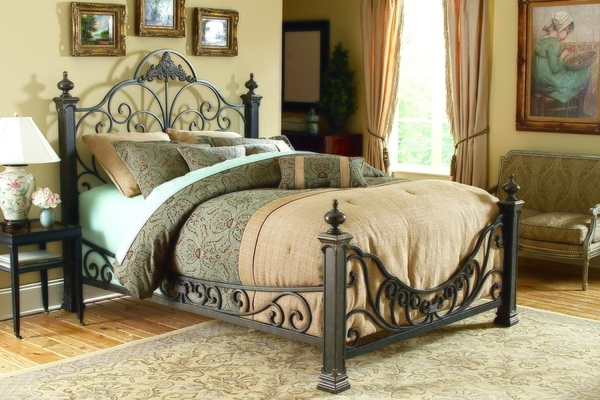 Screw-in finials make this bed compatible with a canopy kit (purchased separately). Dynamic design incorporates elegant curves to makes this piece truly stand out. Hand-applied French Roast finish creates a great neutral backdrop. Strong finials and carbon steel construction ensure long-lasting strength. Also offered as a canopy bed. The Rhapsody bed features soft, pretty curves and a Glossy White finish, making it a lovely focal point for any bedroom. The headboard and footboard include fanciful waves and delicate scrolls, and the posts are topped with round finials, complementing the delightful style of the bed. Really make a statement with the unique headboard and accompanying footboard. This bed is equally at home with bold, bright top-of-bed or soft, muted pastels. The Affinity bed marries sloping curves with straight lines to create a soft, yet strong, feel. Straight spindles, topped with detailed castings, end at the distinct slope of the top rail, which features a camelback curve above. This style is repeated in the footboard, setting the scene for comfort. The deep color of the Blackened Taupe finish provides a sophisticated, neutral backdrop that will match your personal style and bedroom décor. The Argyle bed is named for the diamond pattern in the top rail of the headboard and just above the bottom rail of the footboard. The grills are composed of five sets of double spindles also casted together. A slight curve at the bottom of the footboard gives a bit of additional flair to the design. 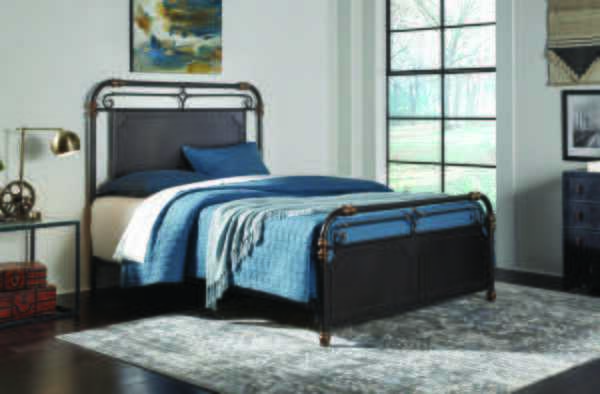 The Copper Chrome finish incorporates a mixture of copper and silver streaked with black antiquing – which will allow the bed to coordinate with many types accessories. Stunning 56” headboard makes this bed the center of attention. Intricate details in the headboard and footboard add sophistication and style. Finished in a Copper Chrome that mixes copper and silver with black antiquing for a truly exceptional look. 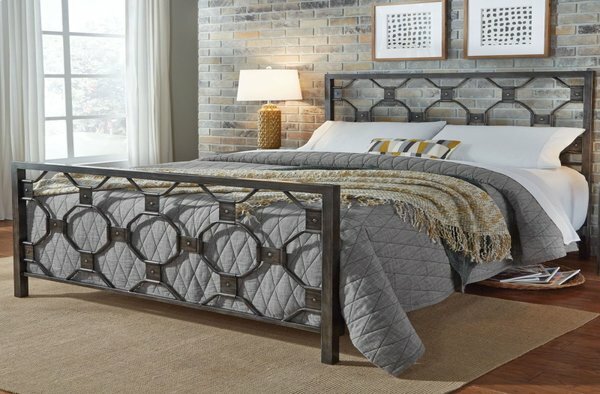 The geometric design in the Alpine bed’s headboard and footboard, along with the Rustic Pewter finishing, give this piece a unique, yet versatile, design. 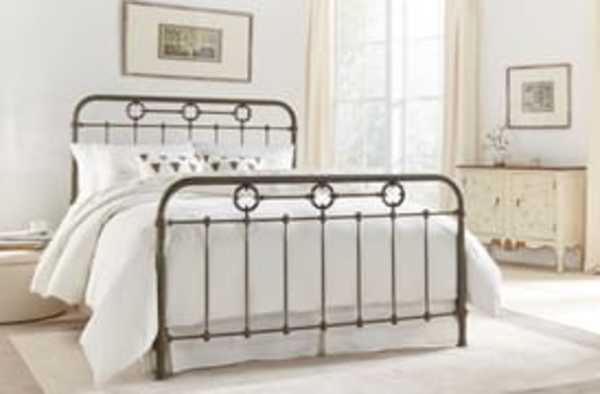 The neutral tone and metal construction make the Alpine bed a great canvas that works with any bedroom décor. This bed conveniently ships in one box and assembles easily using only an Allen wrench (included). Strong construction in a fashion-forward design. Sophisticated pattern in headboard is repeated in footboard for a cohesive feel. Finished in a distinctive Rustic Pewter that sets this piece apart. 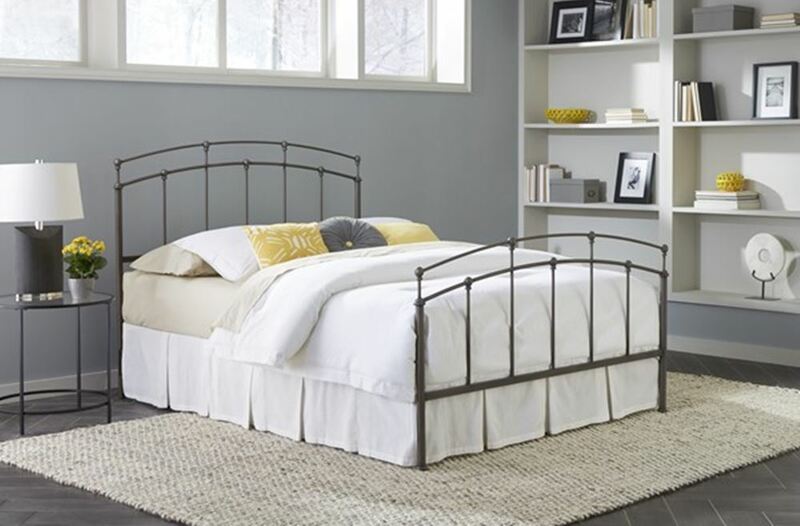 Add transitional styling to your home with the Baldwin bed. 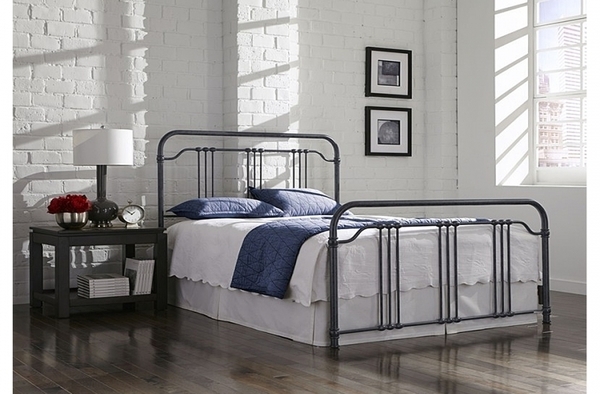 This bed features metal posts in the headboard and footboard that curve to form the top rail. Detailed castings throughout enrich the design of this bed, which is finished in a stunning Textured Black. 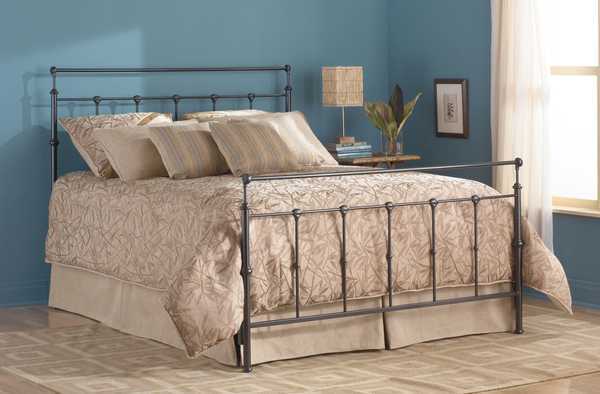 This bed frame consists of iron rails, cross arms, and feet to provide full body support. Contrasting straight and sloping lines display a sense of timeless grace. Constructed of carbon steel for stability and long life. Textured Black finish provides a lovely neutral backdrop for any bedroom. 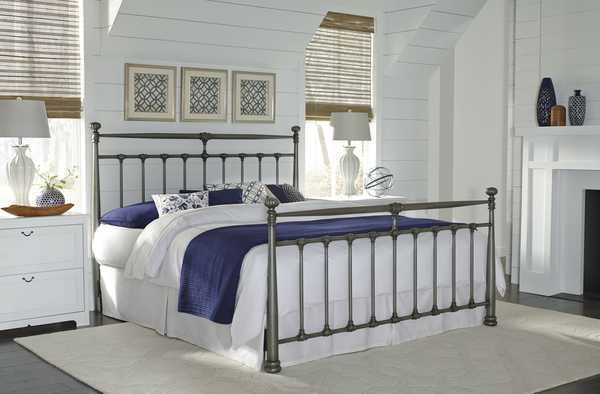 Iron rails offer ample support for any bed. Transitional styling goes with any room’s décor. Add a sense of grace and elegance to a master or guest bedroom with the Cassidy bed. 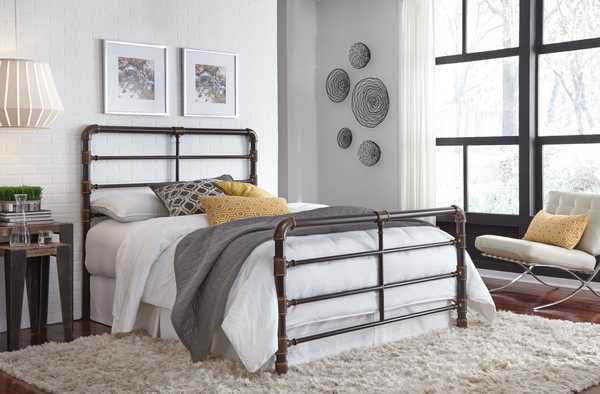 This mixed-media beauty has a Mink-finished grill on the headboard and footboard, which both feature straight vertical lines offset by gently sloping horizontal rails. The four Dark Walnut corner posts are topped with rounded finials that keep this piece looking soft and inviting. Mink finishing complements the Dark Walnut wood bed posts to create a clean and neutral base. Solid construction easily supports a mattress and boxspring. Transitional styling sustains a timeless elegance in any bedroom. The Dunhill bed is a standout among mixed-media beds, with transitional styling in a sleigh design that will complement almost any décor. This bed offers class and sophistication for the formal bedroom, but also warmth and serenity for a more casual atmosphere. The rich Honey Oak-finished wood and soft Autumn Brown swirling scrolls are a perfect blend of light and dark, soft and dramatic. This bed is a charming, romantic addition to a master bedroom or guest room. 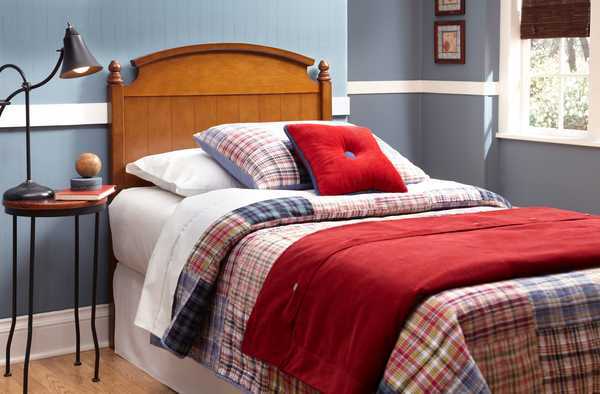 Transitional design features a sleigh-style headboard and footboard. Rich Honey Oak finish on the wooden posts creates a light, gentle feel. Deep Autumn Brown scrollwork throughout the headboard and footboard adds a sense of romance and charm. The Dynasty bed is designed to survive the ages. The heavy top rail defines strength, durability, and quality. A camelback headboard and footboard arch upwards. Underneath, a bold looped pattern spreads out dramatically and each scroll design is finished with gold-highlighted casted ends. The multi-step Autumn Brown finish – textured brown lightly sponged with a gold tint and a soft gold highlight on the castings, finials, and feet – gives the Dynasty added sophistication, as well as a natural touch. Multi-step Autumn Brown finish adds texture and sophistication. Comes in Full, Queen, King. 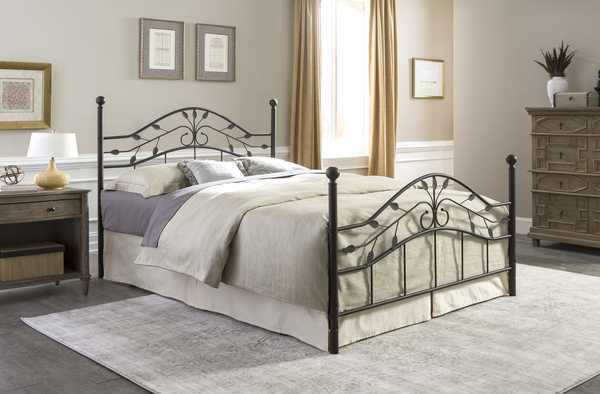 The Grafton bed features prominent scrollwork in the headboard and footboard, secured in place with decorative banding. Solid castings give the bed a playful character, while softly rounded edges provide historic appeal. 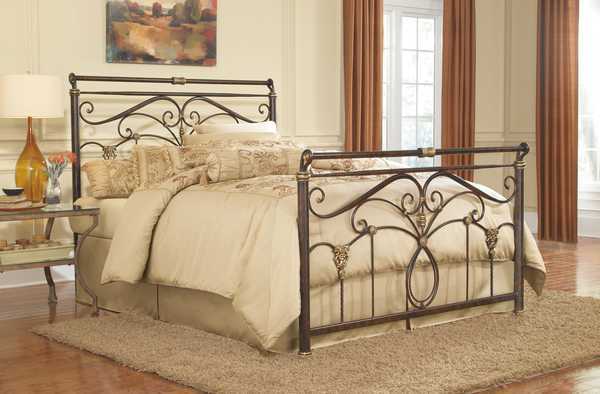 The Rusty Gold finish carries an inner-warmth that elevates this bed beyond typical iron beds. 12 solid castings add rich detail to this beautiful design. Intricate scrolling in the headboard and footboard makes a statement in any bedroom. Rusty Gold finish catches the light, adding a sense of playfulness to this bed. 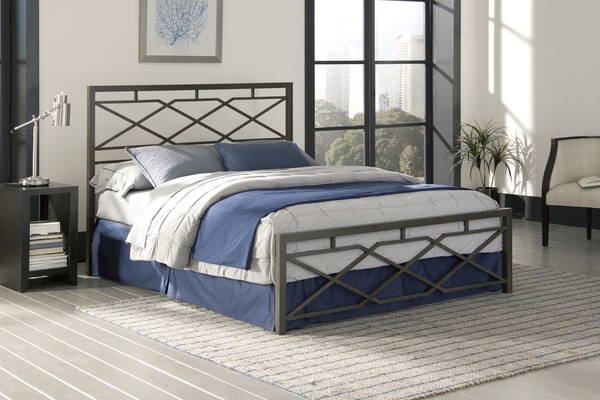 The Lennox bed adds classic styling and geometric detail to your bedroom setup. The top rail features a gentle downward slope while a delightful diamond pattern adorns both the headboard and footboard. 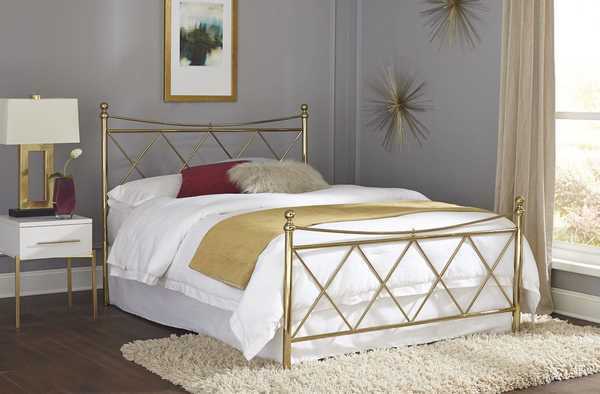 The Classic Brass finishing creates a sophisticated feeling that makes this bed a true statement piece. Classic design fits with any bedroom décor. 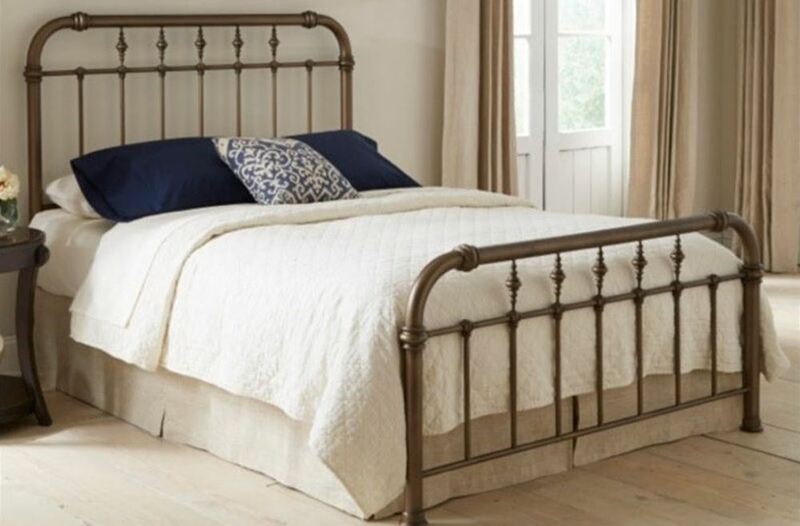 Brass finishing gives the bed a timeless feel that will last for years to come. Sloping top rail and diamond pattern in headboard and footboard adds a unique level of detail. The Lucinda bed incorporates a subtly sleighed top rail, unique castings, and intricate scrollwork to convey an atmosphere of drama and romance. The rich Marbled Russet finish provides the perfect accent to the shimmering golden highlights on the castings. This distinct color combination truly makes a compelling statement of understated luxury. Rich details and ornate design give this piece an unparalleled presence. Marbled Russet finish provides a gorgeous neutral against which the gold highlighting really pops. Curving scrollwork adds a sense of romance and intrigue. 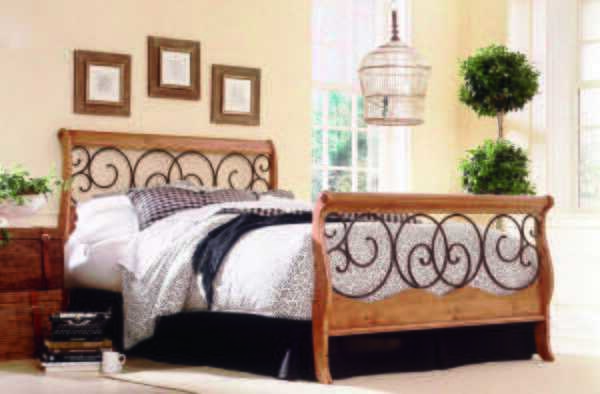 Inspired by turn-of-the-century, high-end French designs, the Madera bed delivers classic style and elegance. The headboard features three two-toned brass color-plated circular designs, which is mirrored in the footboard. Spindles through the headboard and footboard end in intricately carved castings. 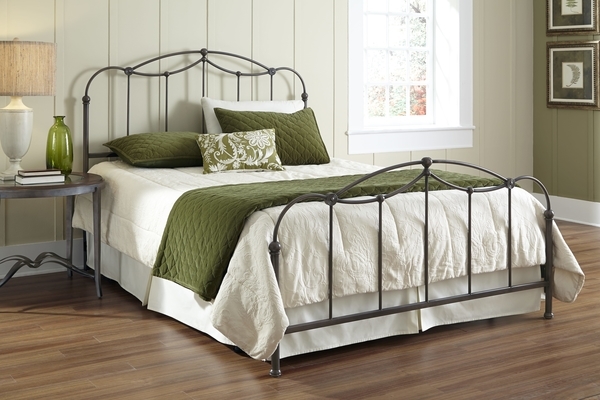 A unique Rustic Green finish sets this bed apart and makes it a truly stand-out piece. Classic, turn-of-the-century design is inspired by French style for extreme elegance. Rustic Green finish uses a 4-step application process to enhance the richness of the color. 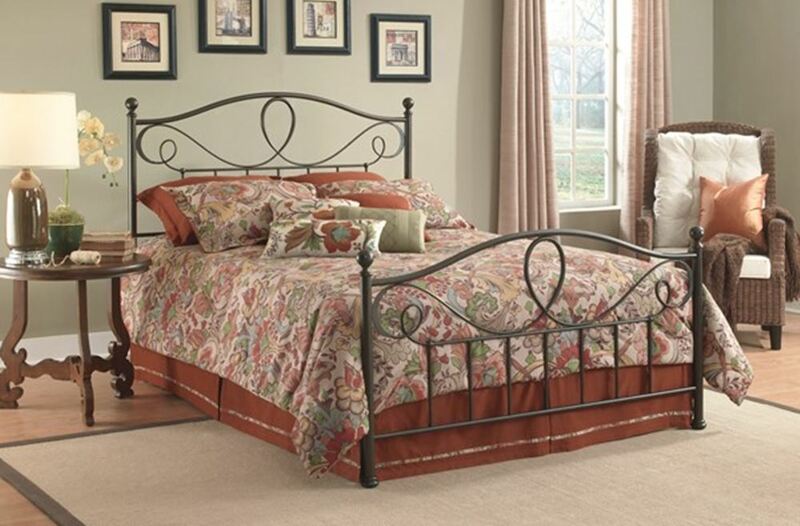 Circular design throughout headboard and footboard adds interest and intrigue. The Miami bed boasts clean lines and ultra-modern styling. The headboard and footboard are designed with square tubing, which adds to the contemporary construction and feel of the bed. Elongated vertical rectangles comprise the grills. Contrasting the square tubing and angular design, the warm Coffee finish has a slight texture to it. The virtually maintenance-free finish blends with almost any color scheme you may choose. Contemporary design is enhanced through geometric design and simple shape. Coffee-colored finish adds texture for stunning eye appeal. Maintenance-free finish provides a rich neutral at home in any bedroom. With an exotic-looking headboard and footboard design that resembles a trefoil arch of the Gothic era, the Pomona bed is not a typical bed. The legs on both the headboard and footboard give way to the gently-curved grill, and each spindle is topped with a small ornamental feature. Comprised of metal with a Hazelnut finish, the Pomona bed is free from finials, instead presenting a gently sloping rail that attaches the posts. Unique details through the headboard and footboard give this bed a universal appeal. 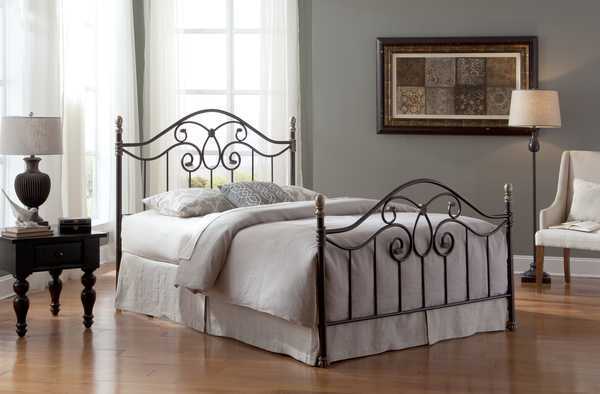 Exotic, Gothic-era design makes this bed center-stage in any bedroom or guest room. Hazelnut finish provides a rich neutral backdrop at home with any décor. Intricate details in the grill and spindles add intrigue you’ll love to notice. Give your bedroom style and class with the Russett Bed. 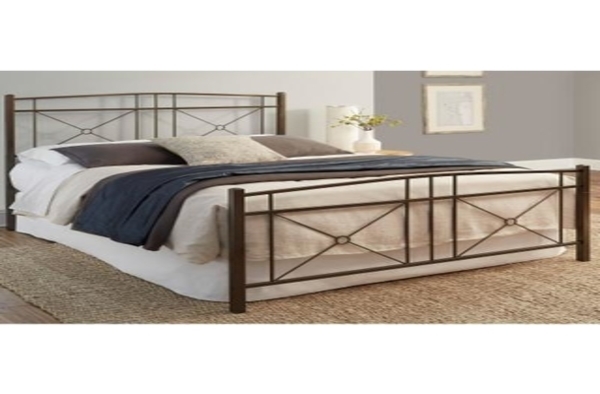 This metal bed is perfect for those looking for quality interior design, and its Liquid Bronze finish is sure to fit in well with a number of complement colors. Enjoy added comfort and sophistication in your bedroom with the Russett Bed. The Matte Black finish present on the Sanford bed is its defining characteristic, to be sure. The powder coat application marries texture to the surface in a way that both mutes and plays with light. The six castings locked in place on this bed are intentionally finished in the same black powder coat to show only their silhouette and accentuate their simple nature. The Sycamore bed captures the wonder of the fleeting summer season. A unique pattern of leaves is forever frozen in space along the headboard and footboard, whirling from an invisible wind. Fence-like posts stand erect, stopping the leaves from cascading to the ground. Widely spaced spindles grace the arms and back of the bed. The Hammered Copper finish has a textured effect with a black base and copper metallic highlighting. Unique leaf pattern in the headboard and footboard create a light, summery feeling. Carbon steel construction stands up to years of use. Hammered Copper finish enhances the summery style of this piece. With a vintage-inspired design, the Westchester bed adds sophistication and style to any master bedroom or guest room. 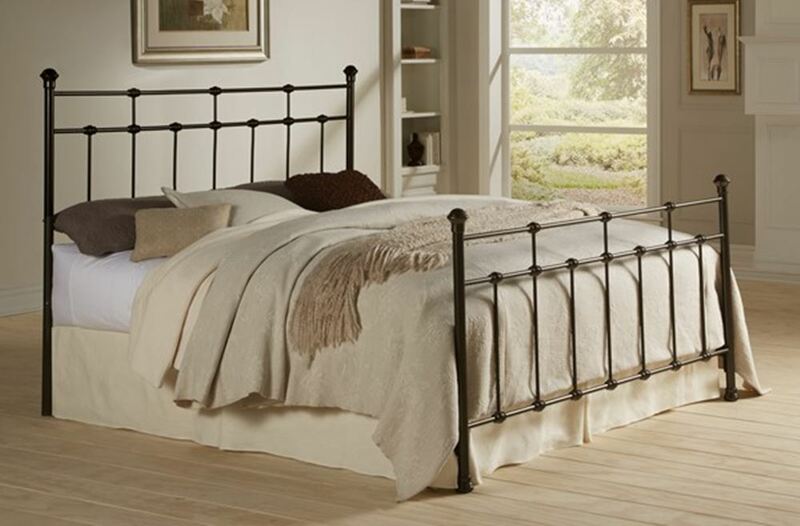 This transitional panel bed features a hand-applied Blackened Copper finish that lends to its timeless versatility. Gorgeous nail head details create depth and eye appeal you’ll notice the moment you enter the room. Vintage-inspired design reminds of times gone by, while remaining stylish and sophisticated. 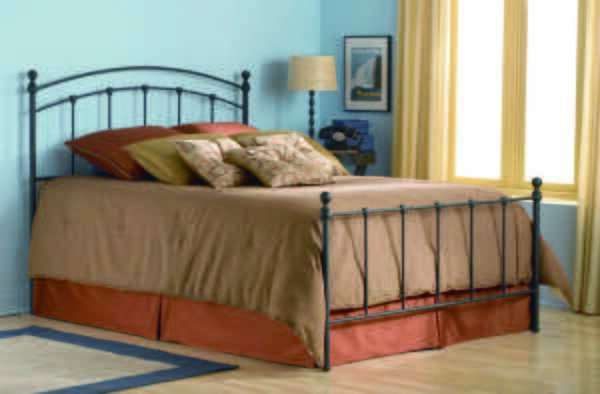 Blackened Copper finish is a versatile neutral that goes with almost any bedroom décor. Nail head details create a sense of depth and intrigue. 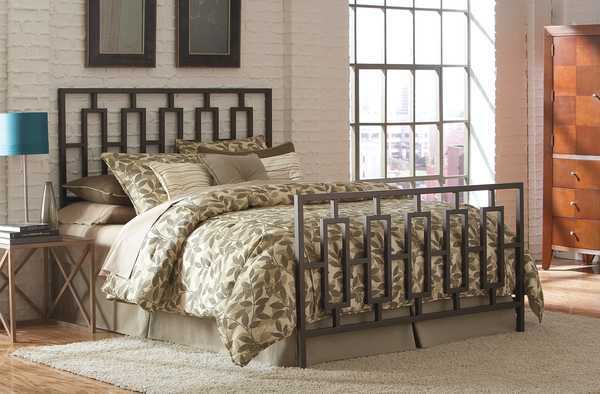 The intricate design of the Baxter Bed is sure to make you fall in love. The headboard and footboard of the Baxter feature a geometric octagonal pattern and is framed by sturdy side and top rails. This intriguing bedroom addition is finished in a rich Heritage Silver that pairs well with any décor. 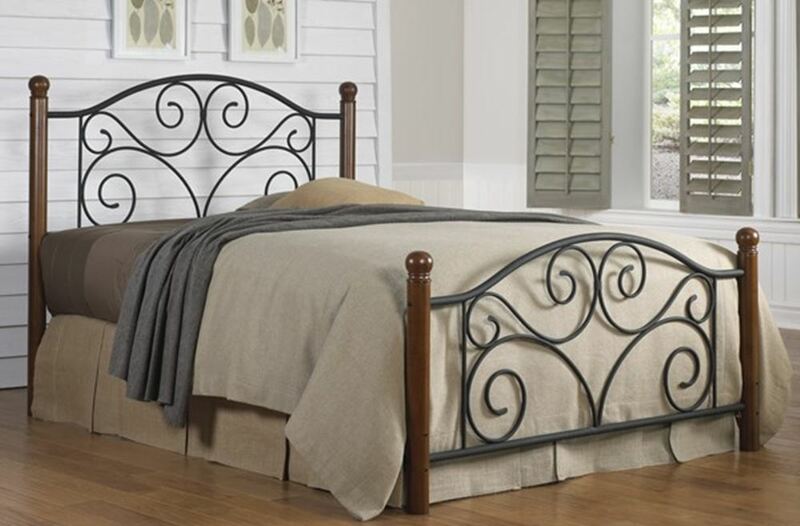 You can’t go wrong with the graceful and versatile Bailey headboard. Soft curves, intricate spindles, and bold posts are all finished in a great Merlot color. The finely crafted posts are topped by smooth, round finials, keeping the edges of the headboard soft and relaxing. Create an elegant, timeless sleeping space that will stay in style as the years go by. The Belmont headboard’s slatted wood grill design is an FBG stand-by with new colors available for an updated feel. This piece is constructed of solid hardwood with MDF spindles for long-lasting resilience. 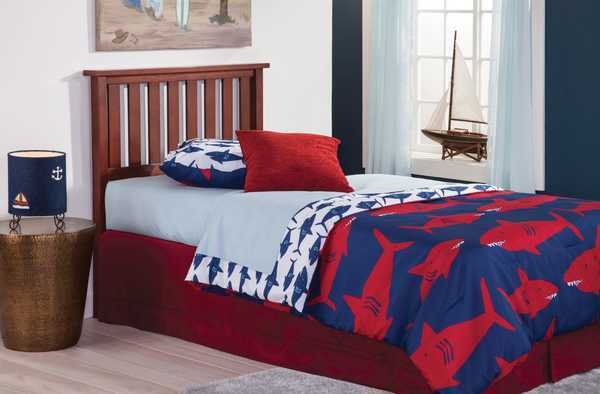 This stylish headboard is suitable for boys or girls, and is even a great choice for adults!